Take a break from Vaasa with a short trip to Saltkaret in Mustasaari, about 40 minutes away. Spend a day of island exploring on the 30th (Sun) at Kvarken Archipelago World Heritage Site. To find other places to visit, photos, ratings, and more tourist information, read Vaasa tour planner. Boston, USA to Vaasa is an approximately 19-hour flight. Due to the time zone difference, you'll lose 7 hours traveling from Boston to Vaasa. In June, Vaasa is little chillier than Boston - with highs of 62°F and lows of 47°F. Finish your sightseeing early on the 4th (Thu) so you can travel to Kristiinankaupunki. 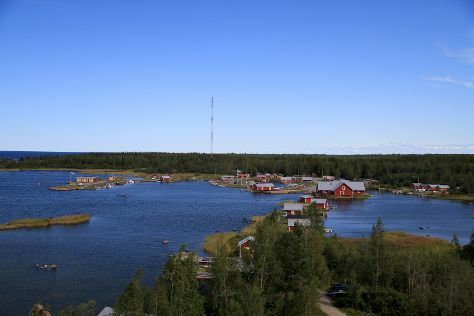 Kristinestad is a town and a municipality in Finland. Start off your visit on the 5th (Fri): don't miss a visit to Ulrika Eleonora Church, then get engrossed in the history at Lebellska kopmansgarden, then enjoy the sea views from Salgrund Pilot Station, and finally see the interesting displays at Carlsro Museum. Plan trip to Kristiinankaupunki with our itinerary maker to find out where to go and what to do. You can drive from Vaasa to Kristiinankaupunki in 1.5 hours. July in Kristiinankaupunki sees daily highs of 69°F and lows of 50°F at night. On the 7th (Sun), you'll travel back home.